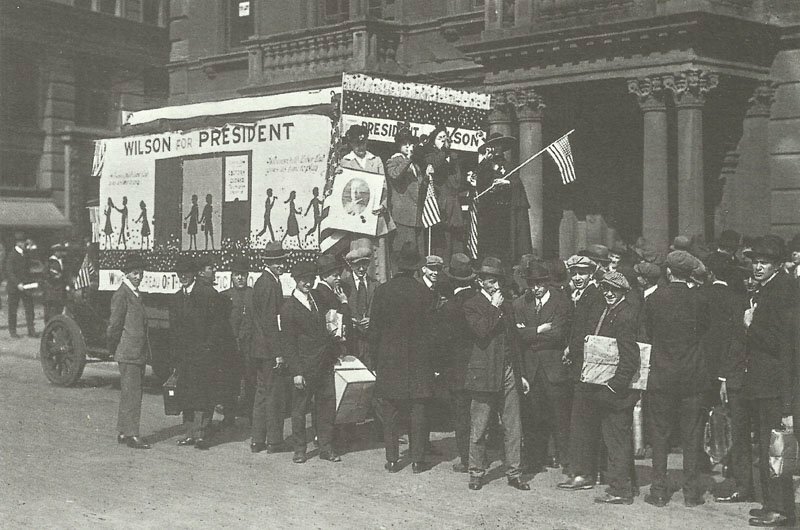 Female supporters campaign for US President Woodrow Wilson. USA: WILSON RE-ELECTED PRESIDENT. Jeanette Rankin (Montana) first Congress-woman. Greece: Admiral Fournet seizes Salamis naval arsenal, sees King on November 9. Battle of the Somme: British gain ground east of Butte de Warlencourt and repulse night counter-attack at Beaumont Hamel. French capture Ablaincourt and Pressoir south of Somme, repulse German counter-attacks on November 12, 14 and 15. Transylvania: Falkenhayn repulsed in Tolgyes Pass (northern) sector but drives beyond Vulcan and Predeal Passes. His Group Kraftt captures Sardoui 16 miles south of Rotenturm Pass (November 8). Germany: Bethmann tells Burian German war aims, latter calls them impossible (November 15).